Yao is ten minutes into cooking lu rou fan, the revered Taiwanese street food of braised pork belly over rice. In Taiwan the dish is a matter of national pride (when the 2011 Michelin Guide suggested that the dish originated in Shandong Province, Taipei’s mayor held a press conference, demanded a reprint, and handed out 1,000 free bowls in the street). But for 26-year-old Yao, it’s also comfort food. His mom grew up preparing this recipe, which she learned from her mother, and as he adds a glug of shallot oil, he says only three people in the world know how to make it this way (now four, I remind him). Kato, Yao’s 27-seat tasting menu restaurant smooshed into the corner of a strip mall on Santa Monica, was originally supposed to be a lu rou fan joint. Somewhere along the line, though, the concept evolved, and the chef—armed with fine-dining experience from stints at Benu and Coi in San Francisco and Alma in downtown L.A.—opened an ambitious Japanese-influenced spot just shy of his 25th birthday. Almost immediately delicate plates of dashi-braised octopus and umami-rich porridge captured the attention of GQ, and Kato landed on the magazine’s list of Best New Restaurants in America 2017. Still, Yao never quite shook his urge to cook Taiwanese food. He briefly offered lu rou fan as a supplement, the same way other chefs might offer a truffle course, but the dish soon disappeared when Yao decided it didn’t mesh with the delicate seafood-centric menu. Then he launched “beef noodle soup night,” a sporadic pop-up inside Kato focused on Taiwan’s other famed bowl of comfort. His version, stuffed with pineapple and foie gras, bears little resemblance to the dry rolls he ate as a kid, yet it’s close enough to trigger nostalgia. The most recent addition is a single fried chicken wing stuffed with sticky rice and shiitake mushrooms. As with lu rou fan, you can find it on street corners in Taipei and, for the first time, on a 12-course menu off Santa Monica Boulevard. “I’m trying to be more proud of my heritage,” Yao says. 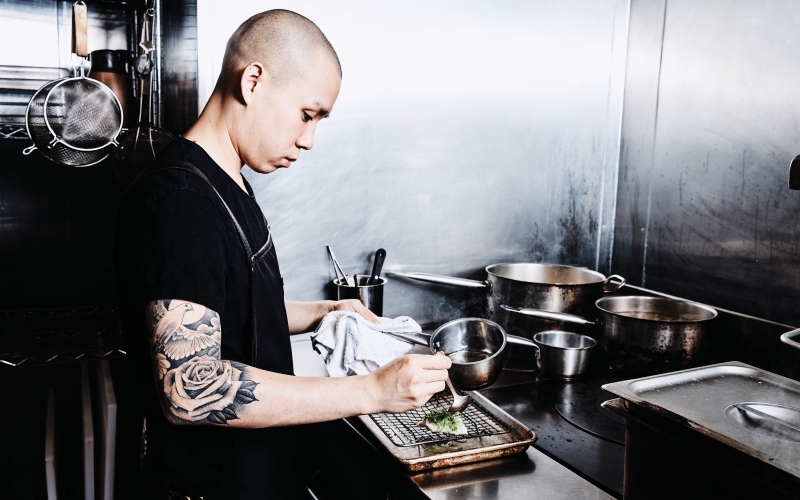 “Every other Asian cuisine has had its moment—Filipino food, Korean food—but Taiwanese food hasn’t.” As for lu rou fan, Yao is looking to relocate his fine-dining concept so he can fulfill his original dream for Kato: serving comfort food that lives up to his mother’s recipes. Previous article3 Distinct Ways to Celebrate the Royal Wedding Day in L.A.